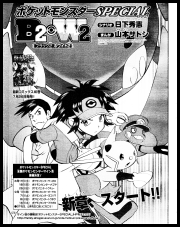 The magazine first started publishing Pocket Monsters Special B2W2 Version in its September 2013 issue. 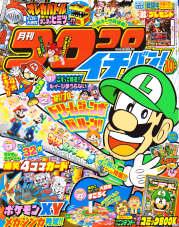 New issues of CoroCoro Ichiban! are released on or around the 21st of each month. Hoodman, who is revealed to be the Plasma-Dan scientist Achroma, speaks with G'Cis about how they used Ohbem to manipulate people into "liberating" their pokemon two years before. Meanwhile, the International Police Agent "Handsome" meets up with his superior, a twelve-year old named "Black No. 2." 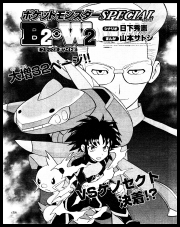 Black No.2 has been enrolled in the Trainers' School in Hiougi City for the past five months under the name Laktoo in order to track down someone connected with the Plasma-Dan. Handsome is suddenly attacked by a suspiciously well-trained Pendra, causing Laktoo to wonder if there's somebody who knows what they're up to. He takes Handsome to a secret base he has set up where his assistant, an agent known as "Magician," gives both him and his Futachimaru a medical check. Laktoo also orders 300 custom-made Monster Ball holders and shows off a training room he has set up that simulates various battle conditions, making Handsome wonder why Laktoo seems to be preparing for war. Suddenly, the agents hear an explosion coming from above! Laktoo and Handsome race up to the roof and find a Genosect hovering in the air, ready to escape! Laktoo's Futachimaru wastes no time jumping forward with its Shell Blade attack. Futachimaru's attack does no damage but does prompt Genosect to lift off and make a run for it. Laktoo jumps on the pokemon's back and radios Handsome to tell him that this is a pokemon named Genosect and that it has a cannon attached somewhere on its body. He knows all this, he explains, because he came across the Plasma-Dan's lab where it was created. Once he successfully tricks Genosect into firing off its cannon again, Laktoo hops off and heads for an abandoned building nearby. There, he finds Achroma, the Plasma-Dan's Dark Scientist! Laktoo explains that he knew the organization was in this building because it's located in the center of the area from which the Genosect would not leave, meaning that whatever device they're using to control the pokemon's mind had to be located there. Achroma begins ordering Genosect to attack, knocking Laktoo off the building and forcing him to make a run for it. Handsome catches up with Laktoo and is surprised to learn that the Genosect that Achroma's controlling is still a wild pokemon. The Monsters Balls that Laktoo had ordered from Magician arrive, enabling Laktoo to stop running and attempt to capture the prehistoric pokemon. Futachimaru attacks Genosect while Laktoo throws Monster Balls non-stop at the pokemon, and about 30 Monster Balls later the Genosect starts to look worn out. Achroma picks up one of the used up balls and notices that Laktoo is using Gorgeous Balls, Monster Balls that help draw out a pokemon's potential by making it happy. He sees this as being similar to his own Achroma Machine, but Laktoo interrupts him and denies that there's any similarity. He then starts to taunt him by saying that his machine's a failure, enraging the Dark Scientist. Achroma goes over to Genosect and swaps out the Normal Cassette on its cannon for a Lightning Cassette and orders the pokemon to attack. Laktoo throws a final Monster Ball at Genosect while it's busy attacking his Futachimaru with an electrically charged Techno Buster attack, catching the pokemon and finally putting an end to its rampage. 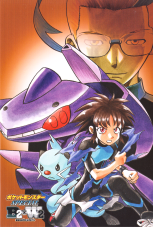 Achroma, as the current leader of the Plasma-Dan, praises Laktoo for being able to capture a pokemon that they themselves were unable to control. After the Plasma boss retreats, some of Laktoo's classmates arrive on the scene and begin to fret over his injuries. He tells Handsome that he still has to keep up the facade of being a student because his original mission - to locate the member of the Plasma-Dan who's hiding out at the Trainers' School - has still yet to be completed. Elsewhere, Hitetoo puts on her old Plasma-Dan uniform for the first time in a while. 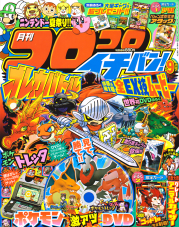 A postcard included with this issue of CoroCoro Ichiban! uses a colorized version of the title page for its artwork. 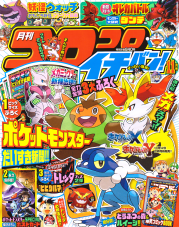 The next issue of CoroCoro Ichiban! 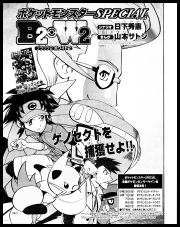 will start off the XY Chapter, meaning the B2 & W2 Chapter will most likely be concluded in the graphic novels.